Based on a grizzly bear, our bear statue is certainly not as fierce as you might think. 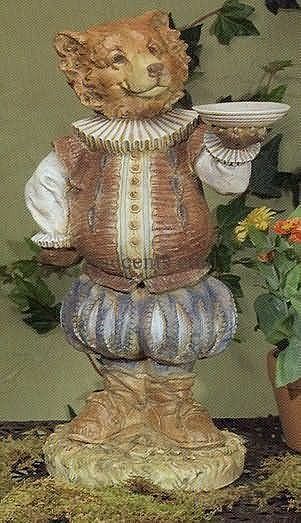 He comes detailed in a classical European wear and is a bird feeder for the lawn and garden as well. Fact is he almost looks like a Puss in Boots! The grizzly bear also known as the silvertip bear or the North American brown bear stands very tall at about 8 ft and weighs some 360 kg (800 lbs.). It is a subspecies of the brown bear that inhabits western Canada and the northwestern United States including Idaho, Montana and Wyoming. Female bears are said to live about 26 years while males tend to live for about 22 years. Generally, grizzly bears are capable of adapting with the seasons. They will eat a large amount of food during the warmer season and they live off the body fat during winter when food becomes difficult to find.